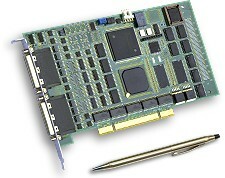 The MultiFlex PCI 1802 motion controller is designed for cost-sensitive yet high-performance multi-axis applications which require up to 8 axes of PWM servo control. General-purpose analog inputs are also available for this model. Shielded 68 conductor VHDCI-to-HD68 SCSI cable for up to 2 axes of I/O. For superior cost-effectiveness and flexibility, the MultiFlex PCI motion controller family uses widely available (and therefore low-cost) industry-standard SCSI cables and wiring breakout boards. For customers who prefer the convenience of ordering these accessories directly from PMC, we provide the parts shown below. For customers who wish to purchase cables in volume directly from a third-party manufacturer or distributor, or for OEM's who may want to design their own custom breakout boards, click here for more information about how to find and specify the right parts.